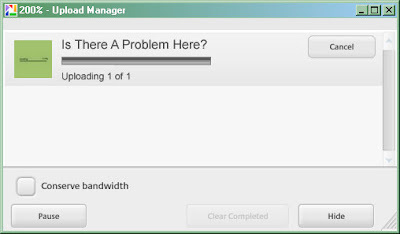 While attempting to upload an image for the previous problem, I see the following. 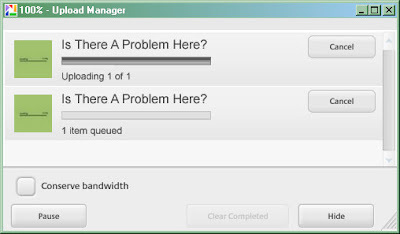 Well yes, there is a problem here. 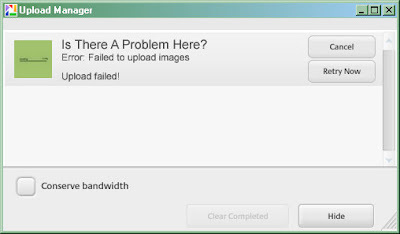 My image does not appear to be uploading. The progress bar stayed at 0% while the title bar says the upload is 200% complete. So I tell it to upload again. Now, I have a second upload of the image in the queue and the first appears to not be going anywhere. The title bar shows 100% complete. So what was 200% of one file is 100% of two? 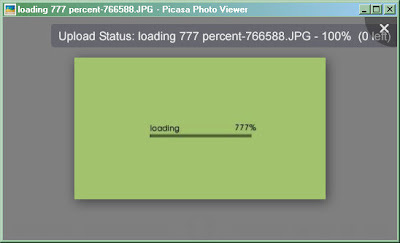 Giving up on that method, I try to upload from the Picasa photo viewer instead of the main Picasa program. This time it works instantly.